2 en-suite bedrooms sleep 4-5 max.Proximity to beaches & top amenities! Enjoy this sunny, bright & oh-so-private Two En-Suite Bedroom 'Slice of Paradise' located in an up-scale Mediterranean Village midway between Nice & Monte Carlo. Rare Private Setting for the 100+ yr old Villa, aptly named Beau Site, is just minutes from beaches, yacht harbour, morning veggie and fish markets, chic shops, top notch restaurants and idyllic walks! The Pisani Agency will provide you with details of the 120 euro non refundable cleaning fee, plus any additional fee at checkout if it is determined that additional cleaning time will be necessary. We strive to have the villa in top notch condition for the arrival of all guests! Linens and towels are NOT provided but Pisani can make arrangements to have them delivered to the villa at a cost to you. You just need to let them know what you wish....such as for the bath rooms including bath mats, kitchen towels, beach towels etc. We wish your vacation to be easy and enjoyable! Please also note that there will be a charge for any check-ins that are not during the normal business hours of the Pisani Agency because they will have to arrange for and pay outside persons to meet you to give you the keys etc. The Garden Flat boasts its own lush private garden and mesmerizing peek at the sea! Entry is through a gated courtyard. Although everything is just steps away, gated parking for two cars is included on site for your convenience! Large sliding glass doors provide your exclusive access to the gardens offering lavender, olive and bay trees, fresh herbs and flowers. The property is available all year round and is ideal for a 'Romantic Escape' or a 'pied a Terre' for the big Festivals of Cannes & Monte Carlo. We hope you will enjoy it as much as we do!!! The Villa: The Salon seats a half dozen or you might want to pull over some of the 6 Provençal dining chairs. Décor is most attractive with the yellows and blues of Southern France, all bright and welcoming. 3 Sets of double doors open off the living and dining rooms onto the patio/garden. Electric shutters are located throughout....just a push of a button! You’ll enjoy a couple of chaise lounges on the patio as well as outdoor dining set with six chairs. Awnings provide shade on hot summer days. The large entry/office offers a futon for any guests over 4, thus sleeping a maximum of five persons. A security system protects your valuables while you're away. Separate formal dining overlooks the gardens and has peek at the sea. Both bedrooms are light and inviting, offer more than ample storage and have their own attached baths. The master has a fixed telephone as does the office. iPod and iPhone docking stations in salon and master bedroom. The Garden: Enjoy a chaise lounge in the garden and you’ll discover why artists and writers have been drawn to this area for decades! The colours and light are magical! You couldn’t find a better place to write, paint, read or celebrate a special occasion. The “promenades” around Cap Ferrat are divine. A tough decision each day is which of the half dozen beaches to visit – two in Beaulieu, several on Cap Ferrat & Villefranche—all within an easy walk. Or would you rather lounge on the patio watching yachts come and go from the harbours in Beaulieu and St. Jean. Each day is deliciously rich in the sights, smells and textures of Southern France. Don’t come if you don’t want to be in love!!! The gardens wrap around the flat and are spacious enough to entertain a large number of guests. Olive, Bay and Palm trees provide filtered shade. The sun does not shine or glare into the rooms of the villa yet moves from side to side providing beautiful light from dawn until dusk. The Area: Water and inland sports abound. You're a short walk from yacht, boat and bicycle rentals, tennis club, para sailing, diving and beaches. Alpine skiing/hiking and golf are easy drives in several directions. Beaulieu offers its own movie theatre. Trains and buses are just steps away for exploring the Cote d'Azur from St Tropez to the colorful Friday market in Ventimiglia, just across the border in Italy. Explore the charming perched villages of St Paul de Vence & Eze or ski/hike in the arriere pays. Concerts, Theatrical Productions, Antiques, Chic Boutiques are abundant. Youre totally surrounded by food, art, wine and the hypnotic Mediterranean culture. The location of Beaulieu sur Mer is very special indeed! Long a playground for Kings and Princesses! You'll discover why!! iPod and iPhone docking stations available in salon and master bedroom for enjoyment of your own music selections! Two toilets total; one shower; one bath tub; master has double sinks, tub with hand held shower and toilet; guest bath has toilet, pedestal sink, shower). Absolute maximum occupancy is five persons regardless of age of guests. The spacious master bath provides large mirrored walls, marble counters & floors, double sinks, bathtub with hand held shower and toilet, the lighting is bright and cheerful, with lovely natural light as well through a large garden window. There is convenient storage for personal items. The guest bath boasts tiles of crisp white, blue and yellow and contains a shower, toilet and pedestal sink. Its lighting is also brilliant in addition to an exterior window. Mirrored closet contains shelving for personal items. Both baths have their own independent electric heaters. ***Note: this apt has not been child-proofed. Three Air Conditioning Units….quiet and efficient…. Both Bedrooms have their own air conditioners plus one in the living area…. Beaulieu and St Jean, Cap Ferrat both have yacht clubs for rental equipment…..
Terrace and large gardens for outdoor dining, lounging etc. Please inquire re Cleaning Fee. The 'office' area provides high speed internet, drawer desk, armed chair, electrical and telephone outlets for your own personal computer. The area is light and bright with a view of the sea and garden. There are no stairs once you enter the villa but showers etc have not been modified to facilitate wheelchairs. Comforters, pillows, mattress pads and pillows are provided for each bed but guests are advised to bring their own linens or coordinate linen rentals with the Pisani Agency. Washer and dryer are available within the apartment. The kitchen is thoughtfully stocked with essentials, including a wide variety of herbs, for preparing inviting dining for intimate occasions or larger gatherings. (Dishwasher, garbage disposal, microwave, oven, cook top, an electric BBQ is available for use of guests. The apartment is air conditioned but sea breezes typically freshens the apartment. Each room has independent heating. The month that we spent in this truly lovely Villa was absolutely delightful! The property is well appointed, meticulously maintained and has every comfort and convenience. The beautifully landscaped private garden is a big plus. Sitting outside in the morning enjoying breakfast and looking at the sea is idyllic. Beaulieu sur Mer is charming with little parks, beaches, and an interesting boat/yacht harbor. It is easy to walk from the villa to delicious pastry and chocolate shops as well as excellent restaurants. The "Super U", a large and well stocked grocery store, is also within easy walking distance as is the daily Farmer's market. Train and bus travel is easy, convenient, and inexpensive. We went to Italy, Monaco, Nice, explored little hill towns with ancient castles and forts, and the homes and museums of Picasso, Renoir, and Matisse. "Beau Site" is the perfect place to enjoy and explore a beautiful part of our world. This spacious two bedroom apartment was ready. Everything was clean and well appointed with local art in every room. Two and a half baths was a pleasant surprise. As this apartment occupies the ground floor of the building, it alone has access to a beautiful private yard and patio. Parking in this area is difficult. The property has it's own gated private parking. The apartment is easily within walking distance of restaurants, shopping, pharmacies, grocery store, train station and bus stops, and the marina and beach areas. While this is not ocean view property in general, I did enjoy a small view of water and Saint-Jean-Cap-Ferrat peninsula in the distance. The train provided comfortable fast service all along the coast in both directions and soon became my frequent choice for transportation. I did note that Uber was in the area, although I did not use it since I had a car. This is a very gifted area, with so many museums, great weather, interesting architecture and a long history to explore and think about. In my experience of vacation rentals, this rental is about as good as it gets. It is truly a wonderful enjoyable place. We have been to Bealieu for several years in February and this is the nicest appartment we have stayed in. It was exactly as it was described..in fact nicer! It is very well placed for everything..shops ,restaurants and public transport. We did'nt hire a car as the bus service is so cheap and the buses run into Nice very regularly. We took a train to Cannes otherwise we used the buses all the time..they took us to Monte-Carlo and Menton..all for 1 euro! We were met at the Appartment by Warda who was delightful and very helpful...nothing was too much trouble! It was an extremely relaxing week for us...we shall definitely be going back next year! This is indeed a "Beau Site" in Beaulieu (the town is so aptly named). 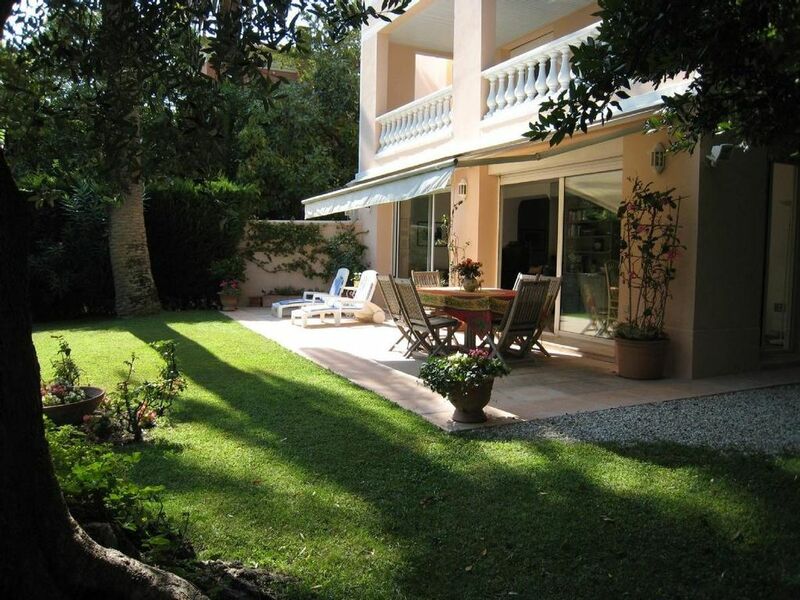 The apartment is light and open to a lovely yard and garden, looking out to the Mediterranean. The terrace is a real treat: catch the rising sun and the birds over breakfast, roll over to the lawn chairs for an after lunch siesta in the shade, watch the rising moon for dinner. The farmers' market, town, train station and beach are all close by. Wonderful walks.... Read the guest book for great tips on restaurants and sight-seeing. The apartment is so comfortable and well-equipped that it is hard to leave! Wir kennen und lieben Beaulieu seit vielen Jahren und haben dort immer schön gewohnt, entweder im Hotel am kleinen Marktplatz oder in einer gepflegten Ferienwohnung. Diesmal (im Frühjahr 2012) war es diese zauberhafte Wohnung mit Garten in der wir mit unseren Enkelkindern (2 Jungen 7 und 9 Jahre alt) sowie deren Eltern 1 Woche verbracht haben. Die Beschreibung von Sue aus Cumbria, England ist perfekt, insbesondere auch was die Freundlichkeit und Hilfsbereitschaft von Warda betrifft. Wir werden mit Sicherheit wiederkommen. Beaulieu-sur-Mer is a friendly sophisticated village on the Mediterranean Coastline tucked in between Nice & Monte Carlo! A lovely horseshoe shaped harbour framed by the beautiful Alpes Maritimes provide a truly magical setting! Its location provides easy access to some of the most famed and glamorous venues in the world yet affords privacy and the utmost in luxurious tranquillity! Elegant “Traiters” offer elegantly prepared food to carry home or shop the daily outdoor fish and vegetable/fruit market for your own Provencal Creations. Fresh meats, cheeses, wines and pastries will beckon. The very French kitchen is fully equipped! Prefer a carefree style on vacation? Choose from an array of popular restaurants ranging from outdoor seafood dining at the port, friendly neighbourhood pizza or a sumptuous Michelin Starred dining experience at La Reserve seaside! Or, if it’s yachts you love, there is no better place to spot some of the world’s loveliest!! Other Activities: Boat & yacht rentals, parasailing, paddle boarding, water skiing, hiking, gambling in nearby Monte Carlo or right here in Beaulieu, movie theatre, local concerts and art openings, museums. Beaulieu has a very large upscale well stocked grocery store also offering a large selection of fresh fish. The outdoor market for fresh produce and fresh fish is available six days a week…..plus on Saturday and Sunday you will find the traditional Provencal Market offering local food specialties to shoes, jewelry, clothing, leatherware etc. Please inquire with the Pisani Agency re the 120 euro minimum cleaning fee, security deposit and charges for linen rentals. There will be a non-refundable cleaning fee of 120 euros in addition to the rent. IF there is excessive cleaning to be done, you will be notified and charged accordingly. Local calls are free. There will be charges for long distance calls made on the fixed line if not free by the carrier Orange. Rental rates for long term rentals are negotiable but electricity will be an additional expense for long term renters. ALL rentals require a Security Deposit. No linens or towels are provided. Please obtain detailed information for the above from the Pisani Agency before booking. We wish to make your stay as comfortable and easy as possible! Please be certain to check the currency that the rates are quoted.....sometimes the website defaults to British Pounds....but you may indicate on the website the currency you wish shown..... Please also note that if you do not arrive during Pisani's normal business hours, Pisani will need to hire and pay outside persons to accommodate your late check-in and thus that fee will become your responsibility due to the non business hours check-in time and its related charges.